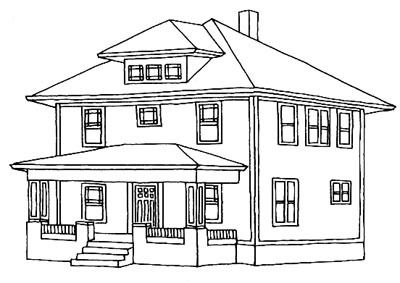 dressed up like a lady: The American Foursquare and the Prairie School. 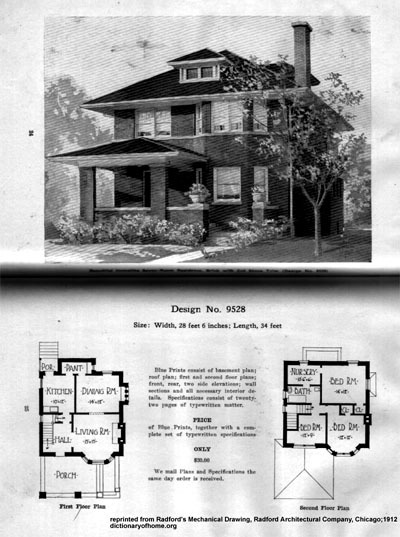 The American Foursquare and the Prairie School. Call me crazy, but I'm pretty sure most lovers of vintage clothing and antique housewares tend to also be fans of historic homes. As yet another expression of style and craftsmanship, it's part and parcel, right? Personally, I dig on many, many periods, styles, and designs when it comes to all of the above. 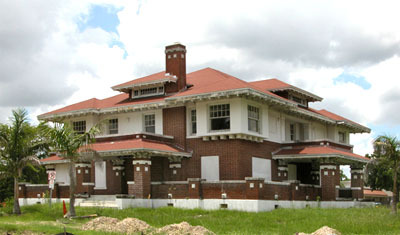 But my undeniably favorite period when it comes to houses is the 1920's. 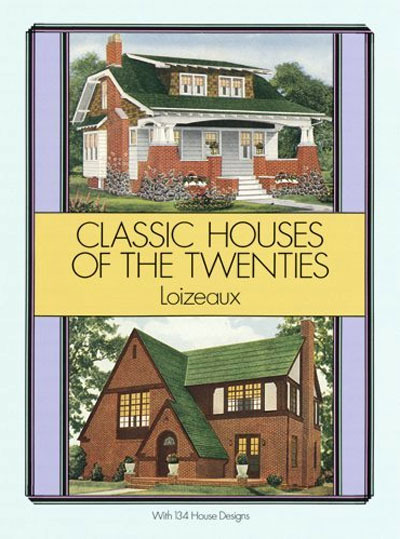 As renters, MC and I used to walk around the very historic neighborhood we bought our house in, gazing at the gorgeous Craftsman bungalows, brick Tudors and trim Colonials, fantasizing about living in a beautiful 20's home. 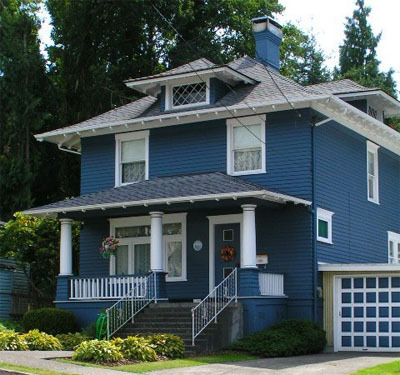 Something I particularly love about the house we bought is that while you can (and probably will) see me drool over the ever popular Craftsman homes (as seen on My So-Called Life and thirtysomething), our house is the slightly less common American Foursquare. 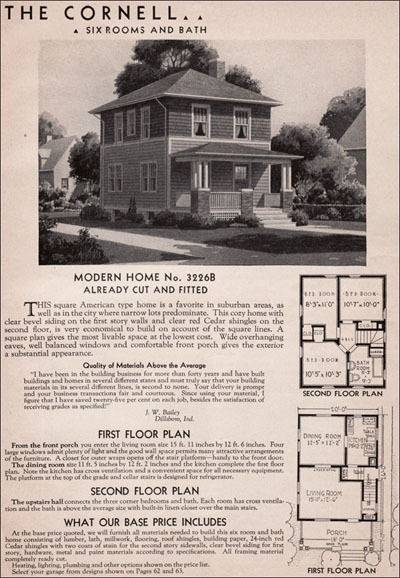 Of course, it's an odd coincidence that the perfect house for us to build our life in just happened to be an American Foursquare -- because I grew up in one! I love how the Foursquare utilizes not just horizontal, but vertical space -- truly measured best in cubic feet, rather than square. 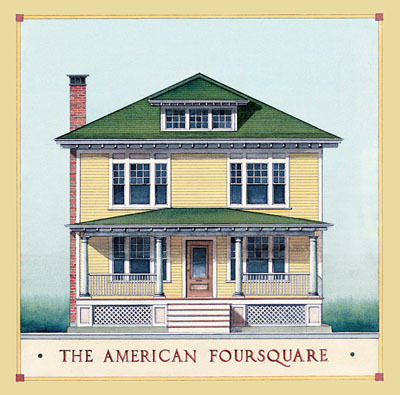 Along with the other houses of the Craftsman movement, the Foursquare was a reaction against the dainty, unnatural feel of Victorian houses (not to knock Victorians -- different colors of awesome, people). There was an emphasis on the entire living space feeling comfortable and natural, without any wasted space. While there are many simplified Foursquares out there, many (including ours) feature a ton of decorative style, with lots of sturdy, quality, crafted woodwork. The interior (which I'll be surely devoting many indulgent, later posts to) is full of diligently crafted woodworking details (hence the moniker the Arts and Crafts Movement) around the windows, built-ins, and on the interior doors to rooms. 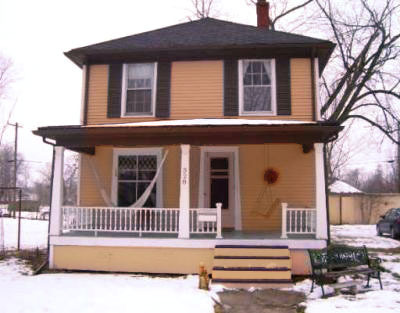 But speaking for the exterior of the house, I LOVE the elongated eaves coming off the roof and bowed lines featured all over the porch. 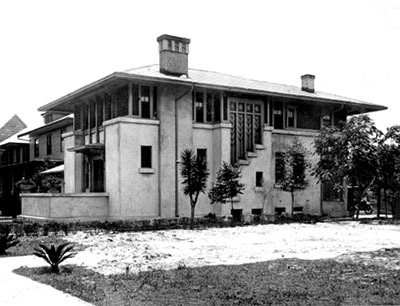 That emphasis on horizontal lines is an example of one of my favorite elements of 20's architectural style: the Prairie School. The use of horizontal lines and disciplined ornamentation was thought to evoke the expanse and feel of the prairie. Which is awesome and all, but is also fascinating when you think about the way horizontal parallel lines would come to be a staple of Art Deco style -- a decidedly urban aesthetic, far from what we think of as rural. I didn't know that these houses have their own name (your blog is very educational). I really like these houses, American architecture it's so different than Polish. Maybe i've been living in apartments too long, but I don't know squat about different house types. All i know is that yours is adorable, and I can't wait for you to start posting room tours! Great Post! 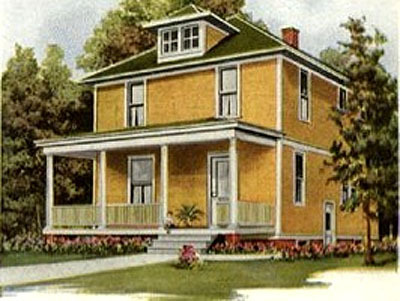 When I was married we bought and lived in a house built in 1923. That house had SOOOOO much character and beautiful wood work! I am more saddened over the loss of the house then I was the divorce!! LOL!! Your childhood home is darling and so is your home now. Good job! Just came across your blog while searching for Arts and Crafts homes like the one on thirtysomething (which I'm just now watching on DVD for the first time -- I love that house!) 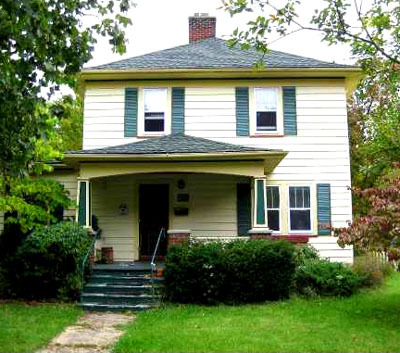 I've been living in an apartment in New York City for the past 17 years, and I'm really wanting to buy a 1920s house somewhere. There are a lot of this style back in the suburbs of Detroit where I grew up -- and you can purchase one for around $125-150K :-) I also like your Foursquare. Thanks for sharing! Thank you so much for posting all this info. I am interested in what people do with the kitchens in these houses. Anyone?